A: There are three way to contact us: Phone 888-367-8931 , E-Mail (customerservice@buyinsulationproductstore.com), and Live Chat (Click on the icon on the bottom left side of the screen). Our customer service department is open weekdays 7am to 5pm EST. Q: Why is your company named Buy Insulation Products? A: In the early days of the internet (or world wide web as it was called in caveman times), there were a lot of websites that discussed insulation but didn't actually sell the products in an online store format. We aren't claiming to be the first online insulation store, but we wanted to differentiate our store from other websites that didn't actually sell insulation. Our name says it all, if you want to "Buy" insulation products, you came to the right place. Q: What locations do you ship to? A: Our site is currently setup to only ship within the United States (excluding Alaska, Hawaii, and Puerto Rico). However, if you are located in Hawaii, Alaska, or Puerto Rico, please feel free to place your order over the phone. The reason for this is inaccurate shipping costs from the online shipping calculator. A: We utilize the warehouses of our affiliates so we have many locations throughout the United States. By having numerous shipping warehouses throughout the country, we are able to get the material to you quickly. Our customer service department is located in New Jersey. Q: Do I have to pay sales tax? A: Buy Insulation Products.com only collects sales tax on orders shipped to states in which we have warehouse facilities located. For orders shipped to the other 42 states, sales tax is not collected. A: Click on My Account on the top of our site and log in. Once logged in you can view the status of your order which will show the tracking number. Click on the Tracking Number under Shipment Tracking and you will be shown the status of your package. Q: How do I know my order was received? A: You will be emailed an order confirmation to the email address you provided during checkout. Q: How do I know my order was shipped? A: You will be emailed a shipping confirmation to the email address you provided during checkout. Q: My Shipping Estimate was very high, is this right? A: A lot of our products are very large and not very convenient to ship UPS. Other items just have unusual dimensions that make it hard for the site to calculate the correct package size. Email us at customerservice@buyinsulationproductstore.com or give us a call at 888-367-8931 (Weekdays 7-5 EST) and let us know your ship to zip code and the products you wanted to order. We will get back to you with the best shipping method and the most accurate shipping amount. Q: I don't know the size of the pipe I need to insulate. How do I measure the pipe? We also recommend ordering a Pipe Caliper which will make measuring pipes precise and easy. Don't hesitate to call us at 888-367-8931. Q: I would like to purchase a very large quantity of Fiberglass Pipe Insulation, can I get a better price? 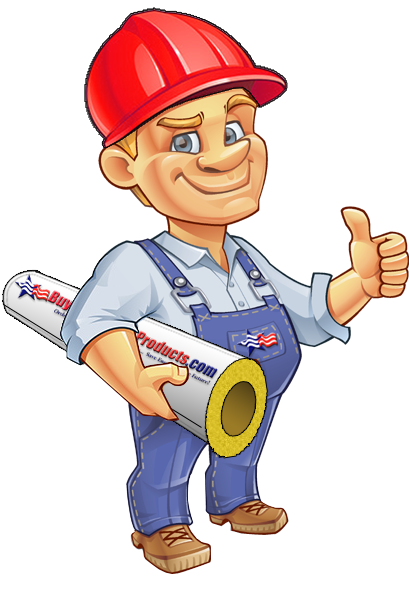 A: For very large orders we recommend our commercial site: www.FiberglassPipeInsulation.com That site is designed for larger orders and for resale accounts. Q: What size PVC fitting do I need to order? Q: Why are asbestos removal / encapsulating products not eligible for returns or exchanges? A: We must ensure that the products we ship out are 100% asbestos free and have had no exposure to asbestos fibers for the safety of our employees, customers, and UPS/FedEx drivers. There is a chance that asbestos removal / encapsulating products may have been stored in an area where asbestos was being disturbed. For moral and legal purposes, our warehouses will not accept returned materials. Please feel confident in purchasing these items from our store as there is no chance of a hazard. Q: I don't have a Promotion Code, am I missing out on anything? A: Once in a while we give out promotion codes to be used during our sales events. Check back often to see our specials and promotions for that week/month. Follow us on Twitter and Facebook to receive all of the updates on sales and coupon codes. Q: My credit card keeps coming back declined, what is going on? A: Our processor verifies the Bill to Address, Expiration Date, Security Code (CVV), along with other information to make sure that the card matches all verification items. Please go back into your checkout and verify that the Bill to Address and other items are entered correctly.